Horse encounters are increasingly rare these days. Downtowners used to regularly hear the clip clop of horse-drawn carriages around Temple Square until the city fathers banned them in 2014. The city’s crowded and polluted streets were not the best place to connect with your horse spirit. Horses need grassy slopes where they can run like the wind, and humans lately seem to need the opposite as they dwell in ever more dense sprawling cities. We’re starting to miss each other. 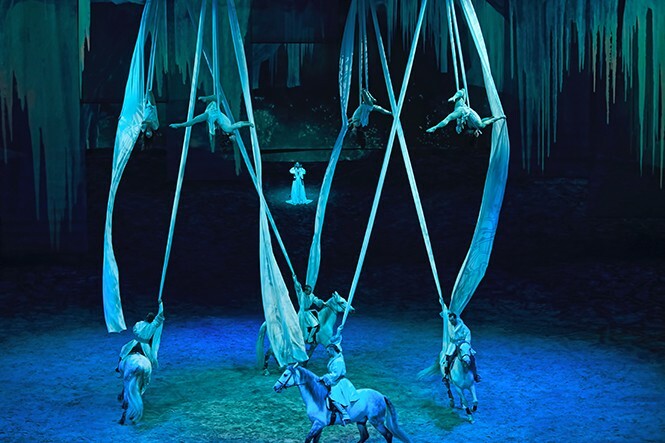 Which may be all the reason you need to plunk down the big bucks to see Cavalia’s Odysseo. If nothing else, you will see horses, 65 or so of the most elegant steeds you’ve laid eyes upon—Spanish purebreds, Lusitanos, Arabians, quarter horses, Appaloosas and Holsteiners and paint breeds among them—performing under a white big top that stands 125-feet tall in a Sandy shopping mall parking lot. 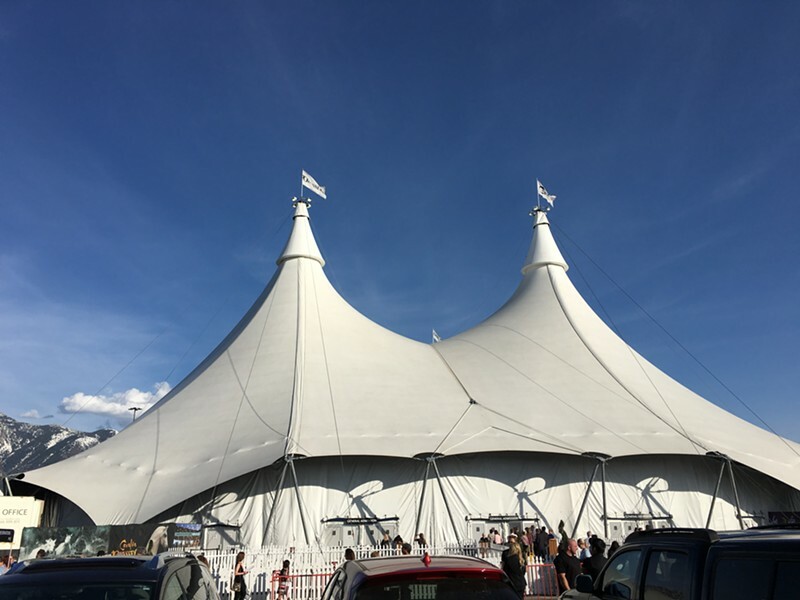 Created by Normand Latourelle, one of the early founders of Cirque du Soleil, Cavalia is a Canadian company based in Quebec that has elevated and transformed the circus experience. 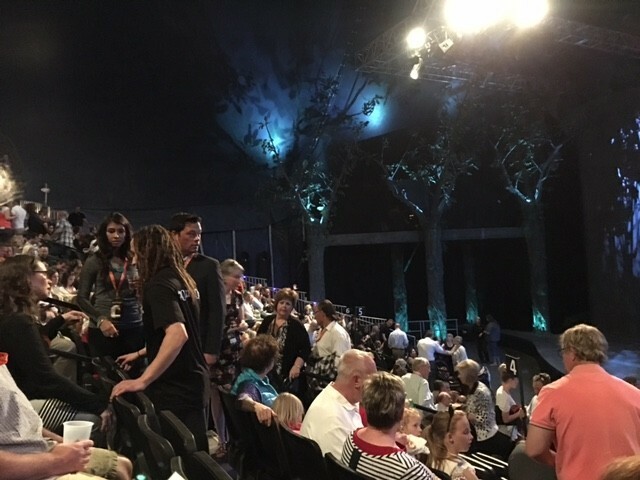 From the seating (for 2,000) to the stage (more than 17,500 square feet) to the IMAX-style screens (requiring 18 projectors and 200 moving lights) to the 365 costumes to the live band that performs music to keep pace with the horses, each element, layered upon the others, conspires to impress. 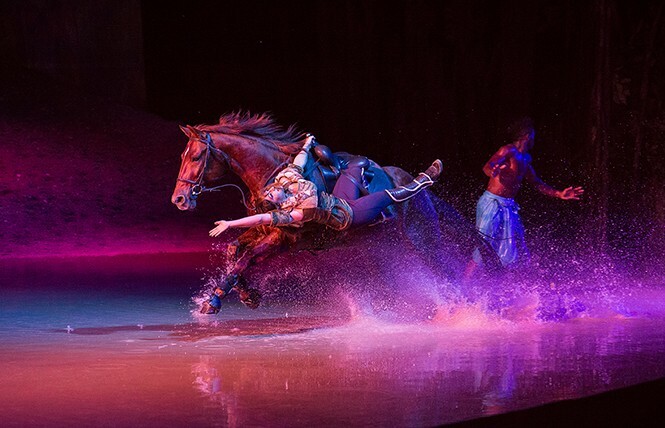 At first, it’s just, “Wow, cool.” But by the end, as horses gallop across a small lake (40,000 gallons of water that pooled before your eyes), you have to surrender to the notion that you’ve been taken someplace new in the realm of entertainment. Yes, it has a lot to do with the visual sleight of hand, as stunning backdrops transport you from forest to jungle to desert to frozen tundra, even to mythical places that seem otherworldly. But the spirit of the horses looms large, and you become a witness to the playful respect between performers and animals. 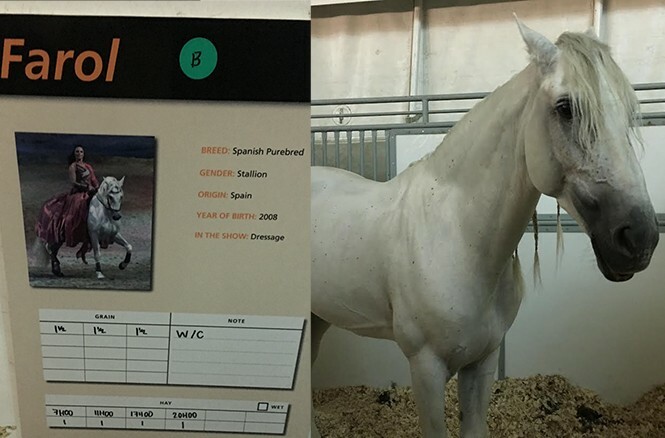 The horses—all male, of which 20 are stallions—have plenty of space to run and strut and prance, and do so in several instances without even a halter or bridle. They don’t seem stressed, which is a concern with many animal performances. According to the website, the animals are allowed to “play” onstage and are not forced to perform tricks. They rotate in and out of performances, and are given days off to rest throughout the engagement. 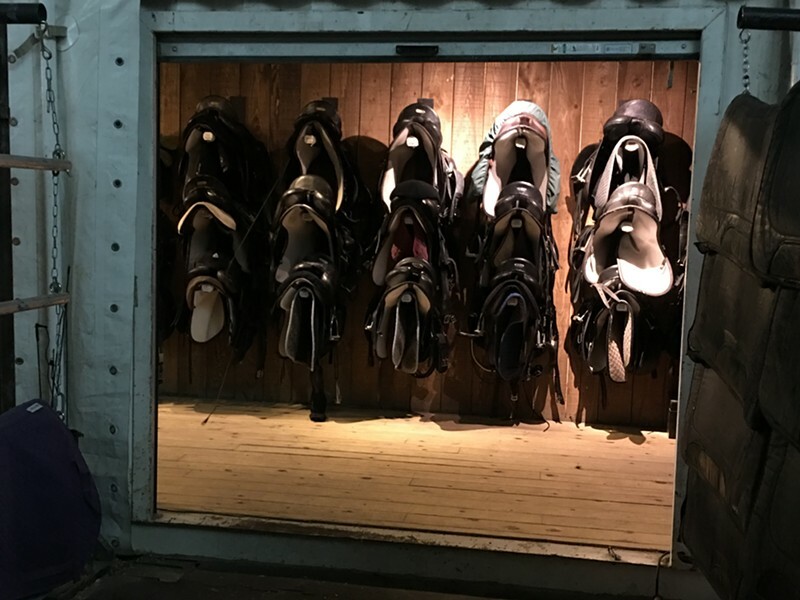 A visit to the stables immediately after the show revealed spacious clean quarters where animals were washed, fed and primped by an attentive staff. It’s unlikely the show would succeed if the animals were pressured or under duress. 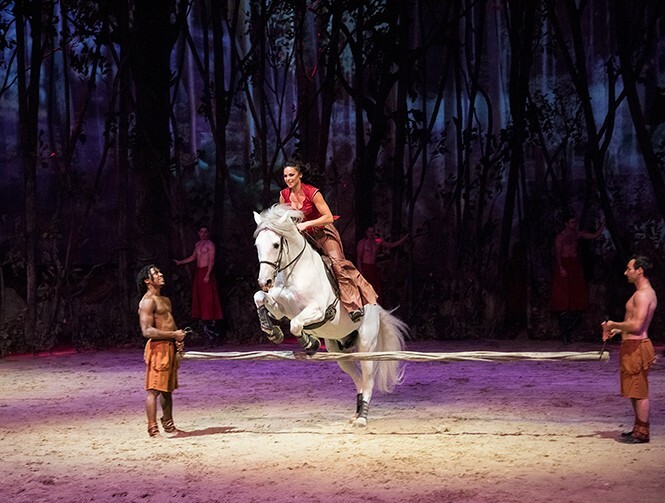 The human performers—48 aerialists, dancers and acrobats—bring a passion and energy to match that of the horses, as acrobats catapult while horses jump, perform dressage and execute stunts. A troupe of Guinean acrobats wowed the audience with their drumming and acrobatic prowess; they had the audience shouting “O walu guere moufan!” which we eventually learn means “No more war on earth,” a touching sentiment as the troupe disappears into the sunset. Such was the magic. The performance, featuring original music that blends Spanish, gypsy, New Age and classical scores, stirs the soul, helping you recall that you are, by virtue of being a Westerner, a horse person. Observing the grace and poise of these equine beings will have re-thinking your mundane existence. So ride like the wind to Sandy and catch this show while it’s in town.